Batch Tested Grade 30 galvanised mild steel calibrated, general purpose short link chain. Available in short, medium and long link specifications. 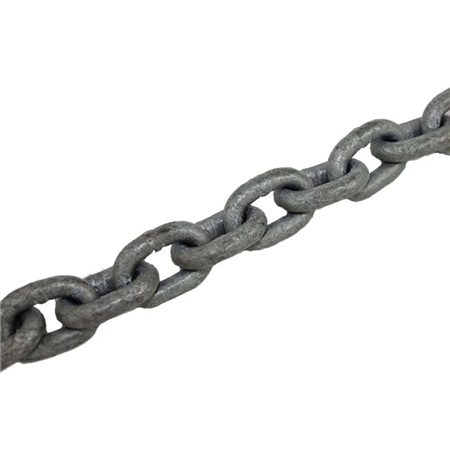 Please note: chain orders over 30kg do not qualify for Free UK Mainland Delivery. If your order does exceed 30kg we will contact you to discuss costs for delivery. To do this in advance of an order, please contact us 01463 229 400. Orders above 30kg can only be delivered within UK Mainland and Scottish Islands (excluding N. Ireland, Channel Isles, I.O.M, Scilly Isles). For delivery outside UK Mainland, please call us on (+44) (0)1463 229 400 for a quote.